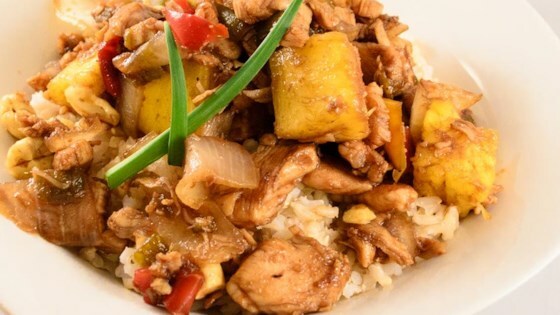 "This recipe combines the flavors of teriyaki sauce, pineapple, sweet onion, red pepper, cashews and a little garlic with tender chicken and swiss cheese (it's a wonderful addition!). It is easy to prepare; just requires a little simmer-time. Serve over your favorite rice." Heat 1 tablespoon sesame oil in a large skillet over medium-high heat; cook and stir chicken, salt, and pepper in hot oil until chicken is almost cooked through, 5 to 7 minutes. Heat remaining 1 tablespoon sesame oil in a small skillet over medium heat; cook and stir bell pepper and onion squares until edges of peppers are tender, about 5 minutes. Remove skillet from heat. Mix teriyaki sauce, chicken broth, chopped sweet onion, and garlic powder with chicken; bring to a boil. Reduce heat to medium-low and simmer until liquid is reduced by half and chicken is cooked through, 15 to 20 minutes. Stir bell pepper-onion mixture, cashew pieces, and hot sauce into chicken mixture and simmer until heated through, 2 to 3 minutes. Remove skillet from heat. Stir pineapple into chicken mixture. Arrange Swiss cheese slices over chicken mixture. Strips of chicken breast simmer in a sweet, spicy, gingery sauce. Olive oil can be substituted for the sesame oil. The flavor of this sauce will vary a great deal with your choice of teriyaki sauce. I use Trader Joe's® Teriyaki and Wasabi sauce.